Standing on the porch, dressed in his Sunday best and holding his hat, this boy looks as if he’s about to leave home. He already has. During the 1800s, to ease the grief caused by a family member’s death, it was customary to observe mourning rituals. These included marking anniversaries of the death by formally viewing a portrait of the deceased. 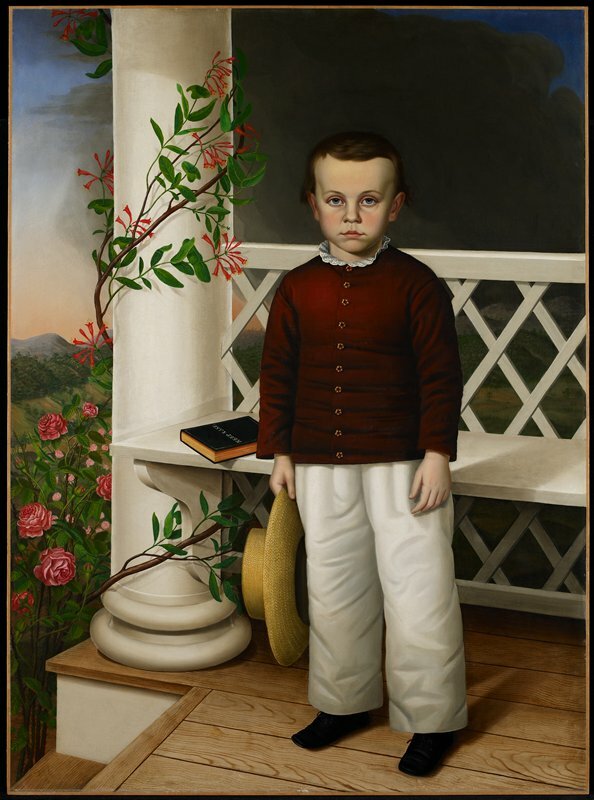 From the traditional mourning colors of red, white, and black, the keepsake book, and the threatening sky, we know this painting served that purpose. The fast-fading roses symbolize the briefness of life, and the clinging honeysuckle vine represents the attachment of the living to the dead. (Anne Kerr Antiques, Minneapolis, Minnesota); Patrick and Aimee Butler, St. Paul, Minnesota;  gift to MIA in 1977. Note in curatorial file states that Mrs. Butler purchased the work directly from Anne Kerr Antiques.